Don't Let the Start Stop YOU!!! Being a winner begins in your mind! Most people believe that they are winners but there actions don’t line up with what they are saying, or as I like to say, their confessions of faith. What is it that you have been confessing but you haven’t been doing? Ask yourself what is stopping you? Are you afraid that you are to late entering the race? Well, I found this video and had to share it with you to cancel the lie of the enemy. It is NEVER too late to get started. Remember, it is now how or when you start. No, it is starting that births the results of the winner in you! Meet me in Jacksonville, FL!!! Where are my Fearless Girlz!?!? Dr. Terresa White and the Heritage Christian Center are bringing us all together in Jacksonville, FL, next week July 18-20, for the Fearless Girlz Women’s Conference and my bags are packed! I’m looking forward to sharing my journey of entrepreneurship and building a 6-figure business with some fearless women. I don’t often get to tell my story, which didn’t happen quick, but I stayed in my lane, I kept focused, and I kept driving (thanks @pastorbhilliard for this!) and I’m living my best life, so far! So, grab your girls and register at www.hccjax.org so you can influence them to do something that will change both your lives! Listen, it’s no fun when you are the only successful one in your circle. I remember when I couldn’t afford to do some of the things I can now but my life changed because my girlfriend @coylitiaoneal asked me to go on a ‘girls trip’ and paid for me to attend a women’s conference (and allowed me to stay in her time share for free) that taught me how to build my business and I’ll forever be grateful to her for that. Now that’s a #girlstrip! You never count your money when you're sittin' at the table. 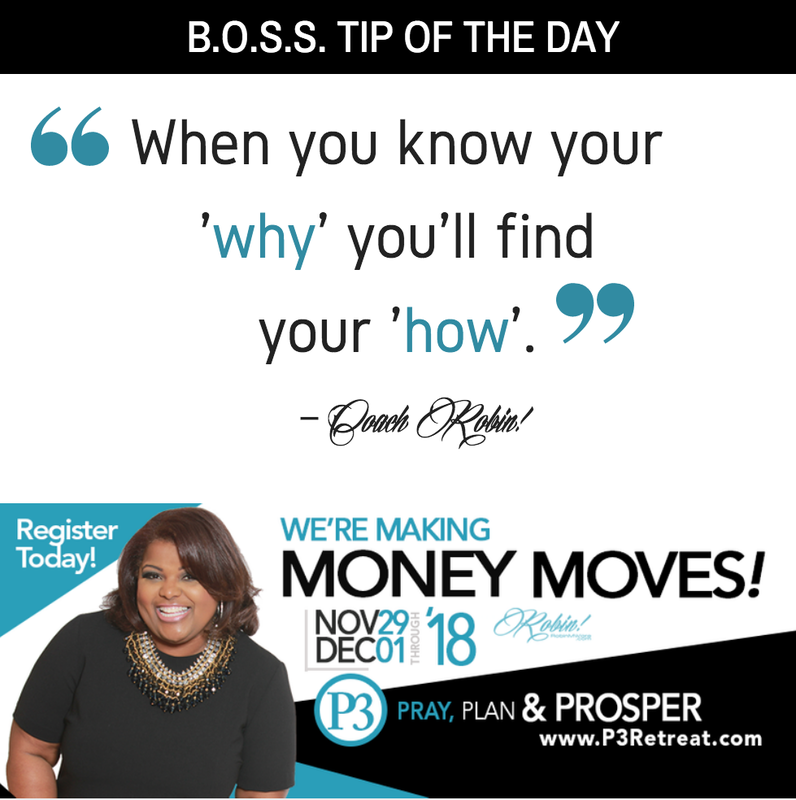 When you understand your why, you'll do what it takes to identify the how. Invite a friend! This is going to bless you! Today I'll be sharing on Facebook LIVE (Coach Robin Ware) my top 10 Things I’ve Learned as an Entrepreneur and some of the cost at 1pm. some coaches only want to show you the bright and shiny side of entrepreneurship but i'm here to show you the murky side as well. I was thinking earlier today about some lessons I've learned and costs I've paid, and I heard Holy Spirit say to share them, flaws and all, so that's what I'm going to be doing. You all know I try my best to be transparent because I want to be a blessing and help others so get ready, because I'm coming with some real truths! Here are my notes so you can read along with me as I share later today. It takes an investment of time and money. Learn how much money I spend some months to make money! You need the buy in of your family. What happened when I told my family I was not going to look for a job anymore. You need to work a JOB if you don't have paying clients that can sustain you. I'll share - the not once but two times - I went and got part time jobs when I had more month than clients! Pressure can be good. Lord, I've had some pressure cooker situations but they made me who I am today! If your budget doesn't allow for training, seek what you can for free. Yes, I pay for coaching now but that wasn't always the case. Some wins come by accident but they still count. I have stories of unplanned victories but they still were victories! Excellence does not equal perfection. Thank God I did not allow perfection to kill my dreams. Master one thing until you do it well. I learned this the hard way! Be careful who has your ear. I had to get the scissors out and you may too! Just do something! I had to learn to take risks and I'll share what happened when I di! Happy Memorial Day and a special thank you to those that have sacrificed to serve our country. Yesterday, I had a brief conversation with a friend after church who approached me and shared that she was ready to get started building her own income streams but honestly wasn't sure how to get started. Getting started involves a few things but most importantly, it begins with focusing on building your audience through an email list. To attract your audience to join your email list you need a lead magnet. A lead magnet is what draws people to your website or landing page so they can opt-in to join your email list. Most people won't just give you their email but if you offer them a free offer like a checklist or 'how to' informational sheet, they will! This 'dangling carrot' is called a lead magnet. For those of you who aren't familiar with what a lead magnet is, it is your secret weapon to get your followers and soon raging fans (because they are going to be so blessed by your teachings!) to join your email list. All successful marketers will tell you that the one tool they always use in their business to create revenue is their email list. Hear me loud and clear: You must have an email list that you are constantly growing to build wealth and your lead magnet is the key to unlocking your wealth building strategy. So, in honor of Memorial Day, I'm going to offer one of my popular teachings - How to Create a Lead Magnet - FOR ONLY $17 today only by entering the discount code: holiday. So, take advantage of this offer and enjoy some barbecue and family time and then rush home and take this training. It is going to bless your life! Be sure to enter the discount code: holiday to get the special price! I'll take YOUR BOOK TOO! About How to Create a Lead Magnet: - this great teaching by Coach Robin Ware, teaches you how to create a free offer (also known as a freemimum) that draws your audience to your landing page or website. In order to get the free offer (lead magnet) they must provide you with their name and email address which is the secret to them voluntarily joining your email list. 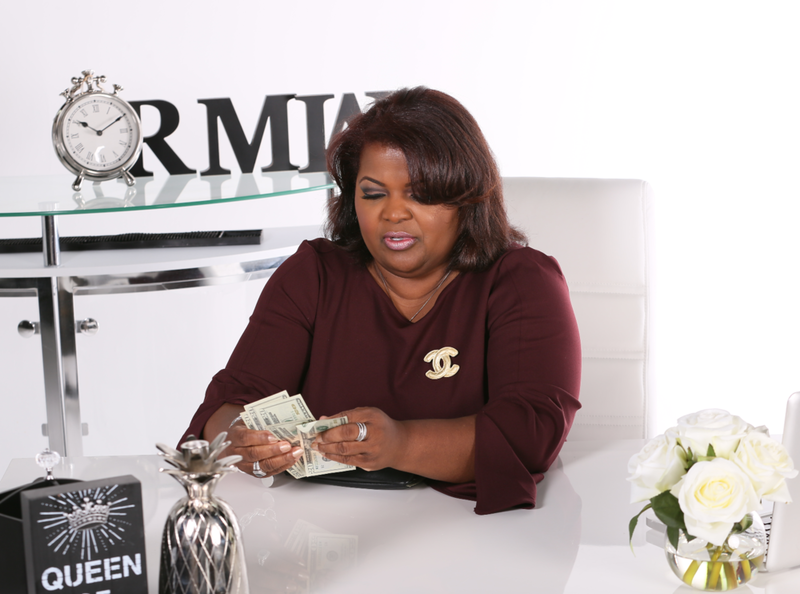 If you've hung out with Coach Robin on Periscope or Facebook LIVE or heard her speak at an event, you've heard her say that the money is in your email list. Your success is depending on you so stop focusing on building your number of followers on social media and instead focusing on getting them on your email list. This way, you can email them directly and share great content, event updates and of course, product offerings! I'm heading to Norfolk, VA to speak at the Econference 2018! If you are in the area, meet me there on tomorrow. More detail are available at www.coachrobinware.com/events. Thank you for connecting with me! I'm excited to start blogging and sharing some of my favorite things, ideas and resources with you!